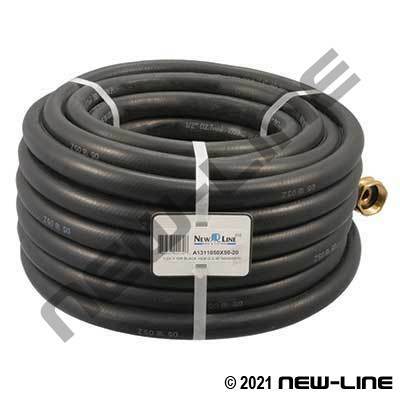 This is an industrial grade water hose that is a popular choice for home owners looking for a good, all around durable garden hose (NOT for use with air and not for food grade applications). It is made from lighter weight, higher grade rubber compounds as compared to our A1311 price sensitive Utility Garden Hose. The rubber will remain more flexible and easier to handle over time as compared to more economical rubber and PVC hoses, especially in colder environments or in applications where it will be frequently rolled or reeled. It can be used as a water, heater, or low pressure spray where oil presence is limited. Its cover is resistant to abrasion, ozone, and weathering. Detail Comments: Each length is coupled with heavy duty brass garden hose ends and all assemblies are neatly coiled and packaged for retail display. Any "nonstock" assemblies can be made up from our bulk inventory.